What’s the Best Electric Snow Shovel? Well, we review a variety of models designed for light-duty to medium-duty usage. These are not heavy-duty snow blowers, but rather, convenient snow machines that are lightweight, compact and quick to turn on and start using. There’s little need to explain what an electric snow shovel is, the name gives you a pretty idea of what you’re getting. For those who might not know – an electric snow shovel will do the same job as a regular shovel when clearing snow from your porch, stairs, walkways and other areas where you would use a regular shovel. The only difference being that an electric motor does the hard work for you. This means that you’ll get the job done faster and with a great deal less effort and backache. While a snow shovel works on a similar principle to a snow blower, in that it uses an auger to lift the snow and blast it away, it is a very different machine and fulfills a different purpose. You won’t get nearly the same cutting depth or width from an electric snow shovel when compared to a snow blower. An electric snow shovel is, therefore, not suitable for heavy snow and nor is it recommended for large areas. If you’re going to be clearing large volumes of snow from your driveway, an electric snow shovel is not the best idea and a snow blower would be a better option. Electric snow shovels are relatively small items and usually weigh less than 20 LBS, making them easy to carry and can be used in places where you simply won’t be able to get to if you’re using a snow blower. An electric snow blower will typically clear a width of around 12” and the cutting depth will be in the region of 6”-8”. While an electric snow shovel isn’t a machine with very complicated technical specifications, some are better than others. One of the big differences being that some use an electric cord, while others are cordless (battery-powered). Cordless electric snow shovels are obviously more convenient, you’ll just be paying more for this advantage and you’re always limited by the working time of the battery. As most cordless tool enthusiasts already know, it’s always a good idea to have more than one battery for your cordless tools. In this respect, you may want to choose a cordless electric snow shovel that shares the same battery as your other cordless garden tools. There are quite a few other factors that separate the best electric snow shovels from the not so good. After reviewing our selection of the best electric snow shovels, I’ll give you some tips on how to go about choosing the perfect electric snow shovel for your needs. This should help you spend your cash wisely. Before we go into all of that, here’s the electric snow shovels that we feel offer you the best value and quality. 13-inch clearing width; 40-volt Cordless. Best electric snow shovel. Starts instantly with the simple push of a button. ✓ View or download the MANUAL for the Snow Joe iON13SS. Snow Joe (and Sun Joe) products are a regular feature on this website and the reason for this is simple, they offer outstanding value for money. The Snow Joe iON13SS is certainly one of the best value for money cordless snow shovels you’re going to find. The 40V 4AH EcoSharp lithium-ion battery, combined with a 500W brushless motor, gives you incredible power and one of the best working times for a battery-powered snow shovel. The guys at Snow Joe claim a working time of up to 52 minutes from this battery – though we all know that one usually gets quite a bit less than any manufacturers specified maximum working times when used under normal working conditions. The Snow Joe iON13SS still beats most others. The two-blade paddle auger does a great job of maximizing the exceptional power of the 40V DC electric motor, moving up to 300 LBS of snow per minute. It clears a path of 13” wide and 6” deep which is pretty normal for a snow shovel of this size. It will throw the snow up to 25 Ft. Comfortable handle. Powered by a 40 lithium-ion battery. 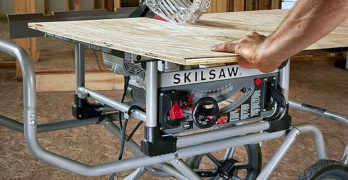 It’s a very easy machine to use with a simple switch button start and a weight of 14.5 LBS makes it easy to move about. The handle is height adjustable, though the grips don’t look as comfortable as some of the more expensive electric snow shovels. The Snow Joe iON13SS is well made and the auger is molded from durable plastic. All-in-all, you’re not going to find a better cordless electric snow shovel for this price and it comes with a full 2-year warranty. Learn more about SnowJoe products by visiting Amazon or browsing the SnowJoe site to see their expansive range of snow blowers and other snow clearing equipment. Impressive 4 year warranty shows GreenWorks stands behind their products. Although the GreenWorks Pro 80V snow shovel is very similar to the Snow Joe iON13SS, it costs a little more. I suppose the GreenWorks name comes at a premium. I’m not entirely convinced that you’re actually getting much more for your money. Though if you already have any of the garden tools in the extensive GreenWorks 80V range of products, it would make sense to opt for this snow shovel as you’ll be using the same battery. The only thing that makes the GreenWorks Pro 2600602 better is the more comfortable and, possibly more durable, handle design. Safety button prevents accidental start-up. The 80V 2AH lithium-ion battery gives you up to 45-minutes on a charge, very similar to the Snow Joe. This battery does have a really good charge time (30-minutes) that also gives it quite an advantage over many rechargeable batteries. The clearing width is the same as most electric snow shovels, 12 inches, and the 6-inch cutting depth is also pretty standard. It has a tough plastic auger that does a great job at thrusting the snow a good distance – though I don’t have the exact distance, I’d guess it’s similar to most others. Weighing 15 LBS combined with an excellent handle design makes the GreenWorks Pro2600602 a very easy tool to use. GreenWorks is a brand that has earned a lot of respect amongst countless homeowners and it does have a few advantages when compared to other cordless snow shovels that cost more or less the same. One of these being a fantastic 4-year limited warranty. 16″ Cordless snow shovel : New for 2017. Based on the reputation of Earthwise, this will quickly rise in popularity. One of the most promising electric snow shovels on the market. Powerful and lightweight. Can clear a 16″ path in one pass. Best electric snow shovel if you’re on a budget. One of the most popular snow shovel for the last few years. A classic model. If working with an extension cord doesn’t bother you, then choosing the Toro 38361 Power Shovel can save you a pile of cash. Apart from the absence of a battery, and the convenience that comes with a cordless machine, it compares with the previous two electric snow shovels in every respect. The 7.5A 120V electric motor drives a curved rotor auger via a ploy V-belt, this is a very efficient system and gives impressive results from this relatively small electric motor. This makes the power consumption excellent when compared to similarly sized electric snow shovels. It has a clearing width of 12” and a cutting depth of 6”. It works through about 300 LBS of snow per minute and blasts it a distance of up 20 FT. The handle is designed for ultimate comfort and versatility, it’s fully adjustable for the perfect working height. It also has a cord lock that will prevent it from unplugging itself as you work. The Toro Power Shovel is a tough machine and will work hard without giving you any problems. You also have the option of a larger 12A version with a 15” clearing width. The Toro comes with a full 2-year warranty. Learn more about the Toro brand by visiting their site. Is an electric snow shovel going get the job done? An electric snow shovel is purposefully designed to be light and compact enough to work in areas that you won’t be able to access with a large machine. For walkways, stairs, and areas very close to buildings, an electric snow shovel is by far the best tool for the job. However, if you’re clearing a long wide driveway, and electric snow shovel is going make the experience a frustrating one and it’s going to take a very long time. An electric snow shovel isn’t the best at clearing heavy snow – you’re limited to a depth of 6”. For larger areas and heavy snow, a snow blower is the way to go. Snow blowers are large and can be quite heavy. A two-stage snow blower is going give the best results – cutting deeper and throwing the snow further, as well as making the job quite a lot faster. The problem is that two-stage snow blowers are usually very expensive and are, with very few exceptions, gas-powered machines. This means you have all the hassle and noise that is associated with gas engines. If you have to do a lot of clearing and you regularly have heavy snow, a two-stage snow blower is worth the investment. If you only need a machine that’s going to give a few more inches width and depth than an electric snow shovel – say to clear light to medium snow from your driveway, then a small to medium single-stage snow blower may be all that you require. You can get a single-stage corded electric snow blower for very little more money than what you’d pay for a corded electric snow shovel and possibly even less than the cost of a battery-powered snow shovel. Clears snow up to 18 inches wide and 7.8 inches deep. The greatest thing about the WEN 5662 Snow Blaster is that it costs the same as many electric snow shovels. This does mean that it’s not a heavy duty machine and you’re limited to light to medium snow. It will, however clear a much larger area, much faster than an electric snow shovel and cut quite a few inches deeper. It has 13.5A electric motor rotates a solid plastic auger at 2000RPM. It will clear up to 1150 cubic inches of snow per revolution of the auger. The result is that you’ll be clearing around 490 LBS of snow per minute. It has a clearing path of 18” and cuts to a depth of 7.8” – throwing the snow up to 20 FT from the chute. You can rotate the cute 180°, so no matter which direction you work in, you can always choose where the snow is thrown. The 6” plastic wheels look quite durable (maybe not the best) and they give a reasonable clearance when working in light to medium snow. It weighs 39 LBS and the soft grip lawnmower-style handle is comfortable to use. You can also adjust the throw distance, in other words how far you blast the snow, with a simple switch at your fingertips. A carrying handle, mounted to the top of the auger housing, makes it quite effortless to carry. WEN products are always good quality and even though this is one of the cheapest electric snow blowers, it’s a fairly robust machine. Though I wouldn’t recommend it for heavy-duty work. The WEN 5662 is excellent for the homeowner who does occasional snow clearing and doesn’t see the need to spend a lot on a heavy-duty snow blower. WEN offers really great after sales service and this model has a 2-year warranty. Learn more about WEN products by visiting their site. When choosing the best electric snow shovel for your needs, you’ll be looking for different criteria than you would for a snow blower. An electric snow shovel is a very portable tool and you’re likely to be using it some tight spaces, unlike a snow blower that has to work in a relatively wide area. So let’s take a look at what this entails – what should you look out for when choosing an electric snow shovel. The clearance width describes how wide the path is that you’ll be able to clear with an electric snow shovel and the cutting depth is how deep this path will be. Both are equally important and should be the first thing that you look at. Most electric snow shovels clear a path of about 12’ with a depth of about 6”. The width of your path and the depth you’re cutting into the snow will determine how fast you can work. Naturally, an electric snow shovel with a wider clearance and deeper cut will move more snow in a shorter time. So on the face of things, bigger looks better. Though is not always the case. Remember that your electric snow shovel needs to get into places where a large snow blower won’t. This means that maneuverability in tight spaces is what you need an electric snow shovel for. If it’s too wide, there may be areas in your garden that could be too narrow for your machine. Generally, around 12” in width is a happy medium. If you’re looking at a wider machine, make sure that it isn’t too wide for the more restricted areas where you’ll be using it. Your cutting depth isn’t going to have a restricting influence, so a deeper cut is always going to make your life easier – that’s if you’re going to be using it in deeper snow. Usually, an electric snow shovel with an auger that cuts deeper into the snow will cost more than one with less cutting depth. So this might be a factor when considering affordability. Much like a regular shovel, an electric snow shovel is something that you’ll be using quite often and you’ll be carrying it around a lot. Fortunately, an electric snow shovel is not particularly heavy – they are designed for easy carrying. Some will be heavier than others and if you’re not up to carrying much weight, a lighter machine will obviously be better. The dimensions are quite important for convenient storage. An electric snow blower with a bulky housing around the auger will not be as easy to store as a more compact model. I wouldn’t worry too much about the amps of the motor when it comes to the actual working of the machine. Depending on the design, a 9A electric motor can sometimes give you better performance than a 12A motor. You want a machine that’s going to move the most snow per minute and throw it a reasonable distance from the area that you’re clearing. Some manufacturers will use a high-amp motor (which will usually be cheaper) whereas others may choose to use a more efficient brushless motor, these will cost more. The auger design can also improve performance. If you’re using a battery-powered (cordless) electric snow shovel, energy efficiency is paramount. A motor that draws a high current (high amperes) is going to eat away at your battery time. Good quality cordless tools use very efficient brushless motors and this pushes up their price. When you’re using a corded electric snow blower, high amperes is going to mean that you’re spending more on the electricity to run the machine. High amps may also be a limiting factor if it exceeds the size of the circuit breaker for the electrical outlet that you’re using and it may also mean that you need to use a thicker extension cord. In essence, low amps input delivering a high power output is the best. Cost is usually my last consideration when it comes to buying tools. I think that quality is worth paying for. This doesn’t mean that price should of no concern to you and some people may have a limited budget. Electric snow shovels aren’t too expensive and a price difference of $10-$20 can make the difference between buying a good quality machine or something that you’ll regret buying. These are not very technical machines, either, so you won’t usually be getting many extra features if you’re paying more. If you feel that a machine is of a good quality standard and it meets your requirements, there’s no point paying more for a more expensive one. Most of the components used in the construction of an electric snow shovel are plastic because this makes them lighter. Though, we all know that some plastic equipment is stronger than others. Usually, if you’re paying a little more (within reason) it means that you’re getting a higher grade of materials used in the construction of the machine.